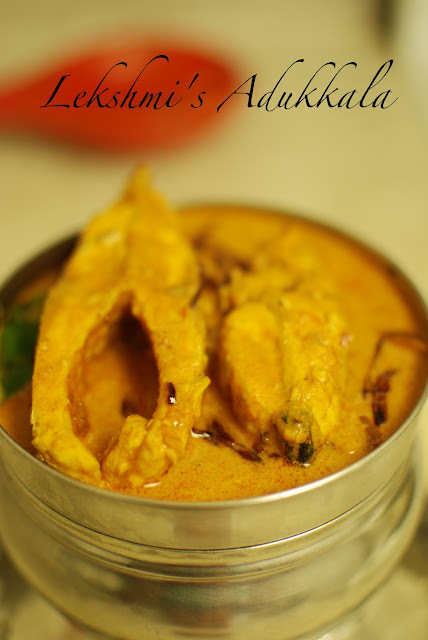 Lekshmi's Adukkala: Meen Curry / Fish Curry in Coconut milk. Meen Curry / Fish Curry in Coconut milk. The description for this item goes here. Clean and cut the fish into pieces. Heat 1 tbsp oil in a pan or chatti. Add sliced onions and Saute till it turns golden brown. Add ginger, garlic, green chilly and saute well. Grind tomato, chilly powder, coriander powder to fine paste. Add this paste into the pan. Add turmeric powder, salt and Tamarind juice along with water and allow to boil. When it starts boiling, add the fish pieces and allow to cook. When the fish is cooked well add coconut milk and remove from fire. Add Sliced Shallot, fry it and add to the curry. Add Curry leaves and sprinkle Fenugreek powder.